Commercial Panic Bars (Push Bars). Commercial high-security systems are a safe, convenient and secure way to exit a premise in case of emergencies for instance on fire exits. They reduce the occurrence of injuries in an evacuation and are a reliable option for retreat. We install panic bars on the inside of doors; we design it in such a way that when you place weight on the door, the latch opens. During a fire or a security issue, everyone tries to reach the nearest exit. 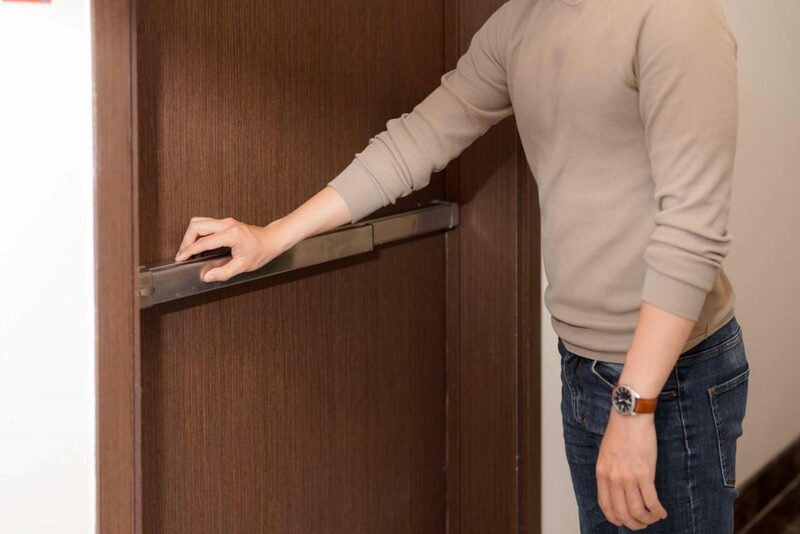 This action can cause unnecessary injuries and a crash when people struggle to pull and open the door. The commercial panic bars automatically open when the weight of people exerts on the door. Besides providing an emergency exit, panic bars also ensure security for commercials settings. Panic bars restrict access for intruders from the outside. We can equip your panic bar with an alarm system for advanced protection. Mobile Locksmith Squad installs a variety of panic bars that you require for your door needs at affordable prices. We mostly install rim panic bars on single doors or pairs of vertical doors with removable or fixed mullions in commercial premises. A rim panic bar provides security because it prevents access from intruders and thieves. We install the rim panic bars with a dead latch, which prevents forceful entry of the door from the outside. There are additional features that we fit with rim panic pars that are client specific. For instance, you could install exterior trim, non-locking passage function, alarms, and a rim cylinder to ensure security and safe exit in emergency cases. They are among the most straightforward panic bars to install mostly to already existing single doors. Our technicians measure the width of your door and advise on the best rim panic bar installation for your door type. We install mortise panic bars for both exterior and interior doors for hospitals, schools, retail stores, colleges and universities among others. Our mortise panic bars are durable, stable and reliable. They provide access to only authorized users and ensure a convenient exit in case of emergencies. We install the mortise panic bars in a variety of doors. Choose Mobile Locksmith Squad for quality, affordable and reliable panic bars installation and other additional features that are user specific. We mostly install them on the active leaf of pair of doors, but we also install them on single doors. Also, we connect them on all materials of doors, for instance, aluminum, iron, and glass doors as long as the stiles are compatible with the mortise panic bars. Our technicians are highly skilled due to experience overtime and install the device at a convenient time at affordable prices. We install vertical rod panic bars for clients who prefer a secure and reliable exit from their commercial premises in case of emergencies. Our clients can have either single or double doors at the top and bottom of your doorframes. The added latching points provide extra security for your commercial premise. The vertical rod panic bars give your entries a modern look adding value to your property especially those that have a concealed version. They can be used together with other panic bar devices for exit purposes inactive doors. Furthermore, vertical rod panic bars are non-handed, reversible and have a contoured crossbar. With our device installation, you are confident of the security of your commercial premise, safe and secure exit in the event of a fire and other emergencies. commercial Panic bar installation in Boston, MA. Trust Mobile Locksmith Squad for panic bars installations. We have a variety from vertical rods, mortise and rim panic bars among others. 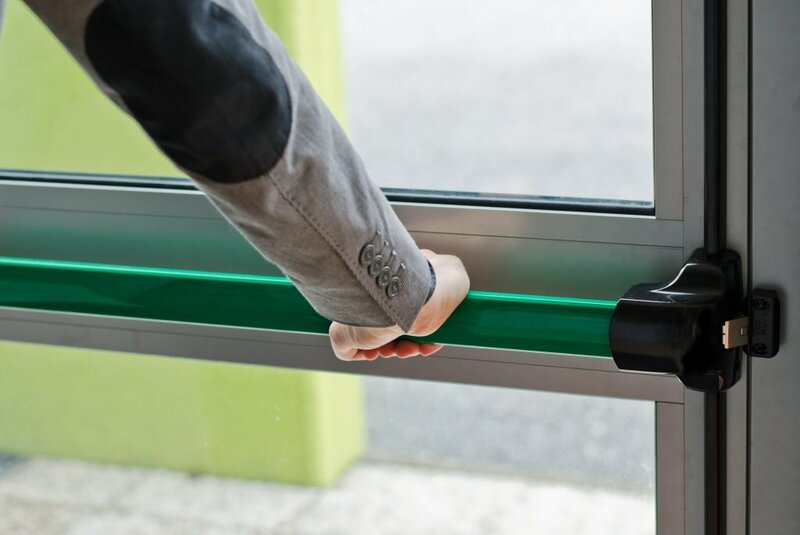 We have gained experience over the years of installing panic bars that suit your doors for commercial premises in the region. Our prices range depending on the type of panic bar; hence, we can work within your budget. They are vital for added high security, secondary exit, and exit during a fire. Our technicians install the device at a convenient time. They are very customer friendly ensuring your satisfaction. Also, they reduce injuries that occur during multiple tragedies. Our panic bars are long lasting and reliable. We can install them with additional features that are customer specific for instance alarms.